Know this guy? If not, then you’re really missing something! 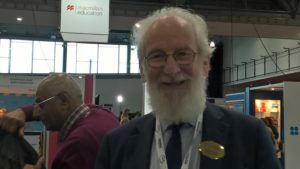 He is David Crystal. Check him out, and if you ever get the chance, hear him speak. Here he is in the IATEFL stand, good naturedly letting many people like me take his picture!